Ruth Weston of Aquabirths in the new Aquabirths birth pool installed in one of Powys’ birth centres. Powys: Supporting women and supporting Better Births. In the heart of Wales, in one of the most rural areas of the United Kingdom, lies the beautiful county of Powys. In this stunning region the recommendations of The Birthplace Study and Better Births are being wholeheartedly implemented. In extraordinary contrast to some areas of the UK, Powys has determined to ensure that Midwife Led Units are recommended as the optimal birth place for healthy women and babies, provided they are happy to birth there – supporting women in their decisions and supporting Better Births. 20% of women give birth in a midwife led unit in this area, compared to 14% for the rest of the UK. Powys has 6 midwife led units across the county, limiting the distance that women need to travel in labour, increasing safety for women and babies and reducing the stress on families at a time where the birthing woman needs to be able to focus on her job at hand. In addition, Newtown, one of Powys’ towns with a birth centre, has recently celebrated the huge achievement of obtaining funding to run sonographer services local to where women are, reducing the travelling distances for women by 3000 miles a year! 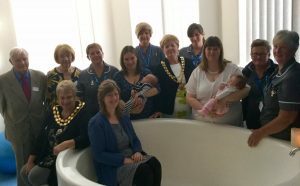 Newtown has also used its funding to add in a permanent Aquabirths birth pool, and a double bed so that new parents can snuggle up together with their baby after the birth, rather than being separated at one of the most profound times of their lives. Well done Powys – you are an inspiration! 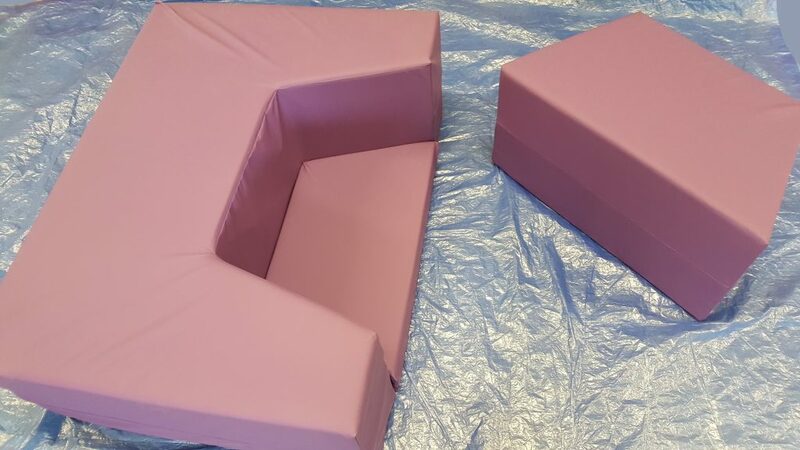 Out with the Obstetric Beds and In with the SoftBirth Birth Couches! 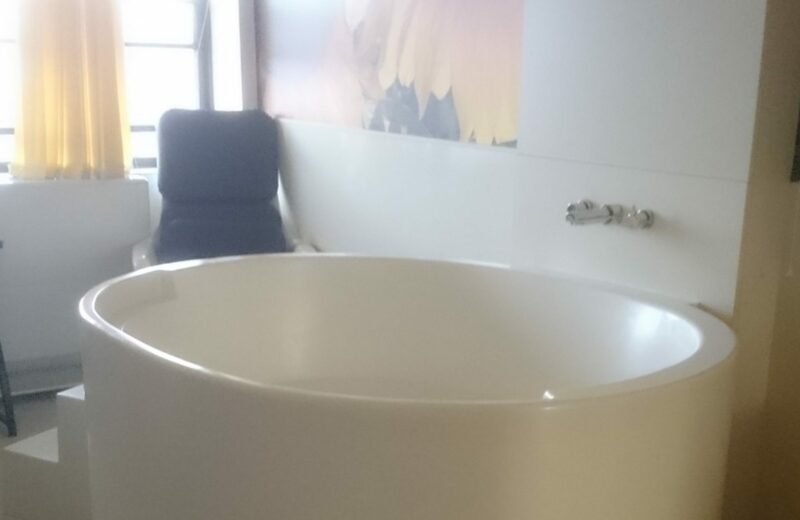 Warrington and Halton NHS Trust have thrown out some of the traditional mechanical beds in both the Midwifery Led Unit (MLU) AND the obstetric unit and replaced them with Softbirth Birth Couches! Knowing that women have the best chance of a positive birth in an environment which best supports a birthing woman’s biological need to move and change position, MLU Manager Carys Hammond, Head of Midwifery Dr Tracey Cooper and their teams have created a hugely positive change in their Trust. Carys reported that the Trust was supportive of the changes. Senior management helped the midwifery team to work through the infection control and governance procedures and getting their support was key to this project. 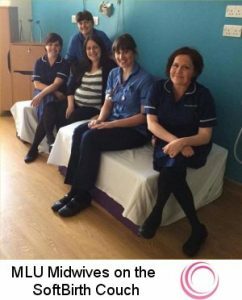 The Trust midwives are ensuring that women are aware of the options of the birth couch in both the obstetric unit and the MLU. This is done in a variety of ways, including their monthly “Maternity Voices” meetings, their Facebook page (link: https://www.facebook.com/WarringtonAndHaltonHospitalsNhsFoundationTrust/) and on the tours around the wards which are offered to pregnant parents. 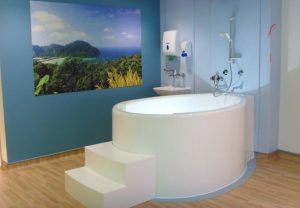 To find more about introducing SoftBirth birth couches into obstetric units or midwifery led units, please get in touch. Barbara Harper, founder/director of Waterbirth International reviews the second edition of Dianne Garland’s textbook ‘Revisiting Waterbirth: An Attitude to Care’ in the context of waterbirth practice around the world. It is no secret that water is healing and that the use of water is an effective medium to facilitate changes in actual brain wiring. 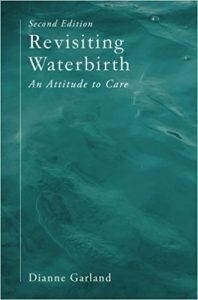 It is with excitement and great pleasure that I welcome the publication of the second edition of Revisiting Waterbirth: An Attitude to Care. Dianne Garland has continued to provide waterbirth education and training not only throughout the UK, but around the world. 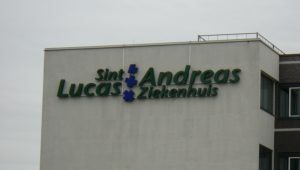 Our mutual passion brought us together for conferences, workshops and presentations many times. It has been my privilege to work closely with Dianne as a teaching partner in China, Spain, the Czech Republic, Israel, India and the United States. Her excitement about demystifying waterbirth is contagious, and the reader, whether midwife, doctor or mother, will experience that enthusiasm within the pages of this book. There has never been a time in our combined history when the message and knowledge within Revisiting Waterbirth: An Attitude to Care has been more necessary. 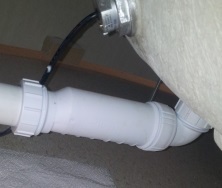 The misinformation surrounding waterbirth that Dianne and I have witnessed in different parts of the world is sometimes distressing and occasionally humorous. This book gives every practitioner an effective, informative guide to start a waterbirth practice and integrate that practice into any clinical setting. It also provides concrete examples and stories from those with whom Dianne and I have worked. The inclusion of detailed stories from practitioners and parents is a wonderful supplement to the new edition of Revisiting Waterbirth. The use of water for labour and birth has increased exponentially since Dianne and I first started writing letters to one another in 1989. When we finally met in person 26 years ago in Kobe, Japan, at the International Confederation of Midwives conference, we excitedly shared documentation of the efficacy and safety of waterbirth. The demand for accurate, useful information and descriptions of experiences has also increased. When we first started our collaboration, waterbirth was referred to as a fad or a trend that would soon be gone. Women seeking the ease and comfort of water will continue to increase in every part of the world. 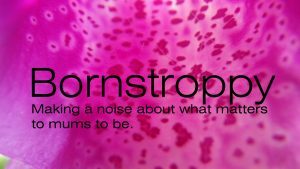 Waterbirth is part of a world movement that seeks a more humane and gentler approach to childbearing. 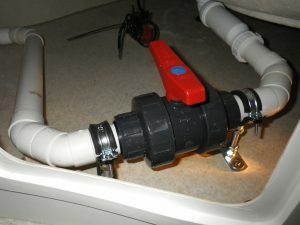 The use of warm water immersion has long been seen as an aid for labour, making it easier for the mother to enter into and remain in a state of hormonal bliss. Today, there are well-designed studies that prove the efficacy of water for labour and the safety of water for the birth of the baby. Dianne’s experience as a hands-on midwife attending waterbirths, as well as her design and documentation of research, makes her the perfect person to lay the foundation of education for those who want to incorporate the use of water into maternity care settings. This book is also a guide for those who have already started waterbirth practice to improve their experience. The message in this book is simple, straightforward and very hopeful. It is hopeful in the sense that more and more women are asking how to make labour less about ‘enduring the pain’ and more about creating a good, healthy and loving experience of birth for the baby. Women understand that creating a new human being is one of the most important jobs on the planet. The providers who serve those women need the encouragement that this book offers to step out of the routine medical care and become open to the possibilities that water can, indeed, change the course of a labour and should be utilized as a valuable tool for almost all women. The attitude with which professionals view a woman’s ability to give birth can either enhance or detract from her experience. In 2014, the American Congress of Obstetricians and Gynecologists (ACOG) and the American Academy of Pediatricians (AAP) launched a campaign to put doubt about the usefulness of waterbirth into the minds of nurses, doctors, midwives and the public. Some US hospitals paid attention to the published and widely distributed ACOG opinion paper and halted their successful and incident-free waterbirth programs. 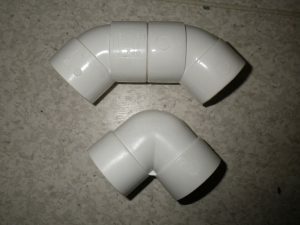 Dianne and I travelled together to hospitals in Cleveland, Ohio, and Minneapolis, Minnesota, shortly after the article was published, to educate hospital staff and help reinstate waterbirth policies in these facilities. We were welcomed in these places and our efforts were rewarded when the practices were put back into place. It is my sincere hope and desire that practitioners throughout the world are guided by the message in Revisiting Waterbirth: An Attitude to Care and start implementing protocols in more hospitals. All women should be offered the choice and opportunity to labor in water and birth their babies with the ease, safety and pleasure that water so beautifully provides. I also hope that our tandem careers continue to bring this message to every corner of the globe. As founder and director of Waterbirth International, I have relied on Dianne Garland to provide a multitude of research and documentation from the UK and have used this book in its earlier editions as a teaching tool and recommended reading for nurses, midwives and doctors. Ruth Weston mother, business woman, lactivist. Ruth is the mother of five children, four born at home and in water. She liked her waterbirths so much she took over Aquabirths as a small Yorkshire birth pool hire firm 15 years ago. Since then she and her husband have grown the business, now, with midwives and doulas, designing pools and soft furniture for the NHS and around the world. Ruth is passionate about women having good care and a good birth: she set up ‘Choices in Childbirth’ childbirth group in her home 14 years ago which became a network of similar groups across Yorkshire and beyond with a regular monthly E-newsletter which you can subscribe to. Ruth helped set up the MSLC in Bradford and Airedale and became its first chair. Ruth is now turning her considerable determination and energy to the delivery of continuity of midwifery carer and the reform of regulation for midwives – structural reforms she believes necessary for the delivery of humane maternity care for women. For 25 years now I’ve been campaigning along side others to improve women’s experience of childbirth. Part of my work has been to provide the means and equipment for better birthing experiences: that may be knowledge and training or it may birth room equipment. If you would like to sign up the monthly newsletter ‘Choices in Childbirth’ or ‘Choices in Childbirth for Midwives’, fill in the form below. Or click on the image below.